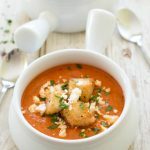 Keto Roasted Peppered Tomato Soup is savory and flavorful. The whole family will surely enjoy this soup and perfect side to sandwiches, salads, and more! Preheat oven to 400 degrees F (200 degrees C) and line a large baking sheet with aluminum foil. Spread tomatoes, onion, and red bell pepper in 1 layer onto the prepared baking sheet. Drizzle olive oil over tomato mixture and season with salt and pepper. Roast in the preheated oven for 30 minutes; add garlic and continue roasting until tomato mixture is tender, about 15 more minutes. Bring chicken broth, basil, and parsley to a boil in a large stockpot; reduce heat and simmer. Put half the tomato mixture into a blender. Cover and hold lid down; pulse a few times before leaving on to blend until smooth, adding a small amount of the warm chicken broth if liquid is needed. Pour pureed tomato mixture into stockpot with chicken broth. Puree remaining half of tomato mixture and add to chicken stock mixture, mixing well. Simmer for 5 minutes.